Hats and other forms of headwear have been part of the human experience from the dawn of humankind. Worn initially for protection, hats evolved into fashion accessories which denoted nationality, social class, and marital status. Men and Women indulged in headwear that was sometimes frivolous and “over-the-top” (excuse the pun!) to conservative or pious depending on the whims of fashion and mores of any given time period. As with all other areas in fashion children’s wear reflected what was happening in adult fashion, sometimes customized for specific stages of childhood development. The doll collector of today can use original headwear to help identify a doll’s specific period or origin. 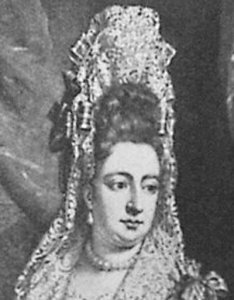 A portrait of Mary II of England, 1688 shows her wearing a fashionable “Fontages” headpiece which was considered to be the height of women’s casual fashion for the social elite of the day. These fanciful creations were made of stiffened fabric and lace on wire frames. The English wooden doll from 1680, known to the world as “The Old Pretender,” retains her Fontages headwear. Photos ©Victoria and Albert Museum, London. 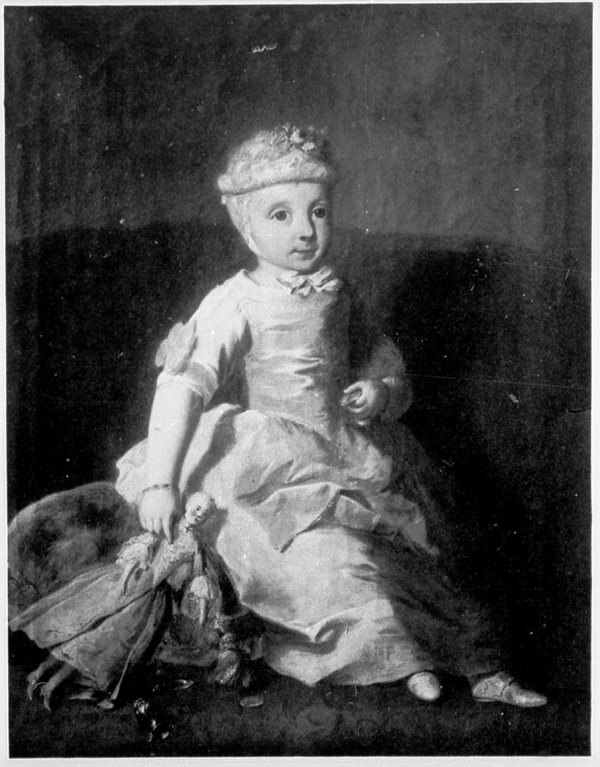 A portrait of the Little Princess of Braunfels by Anton Wilhelm Tischbein, c. 1765 shows her wearing her Pudding cap. 17th and 18th century children generally wore miniature versions of adult clothing. One exception to this was the “pudding ” cap worn by young children. These padded caps offered some protection to the heads of children who were not yet steady on their feet. 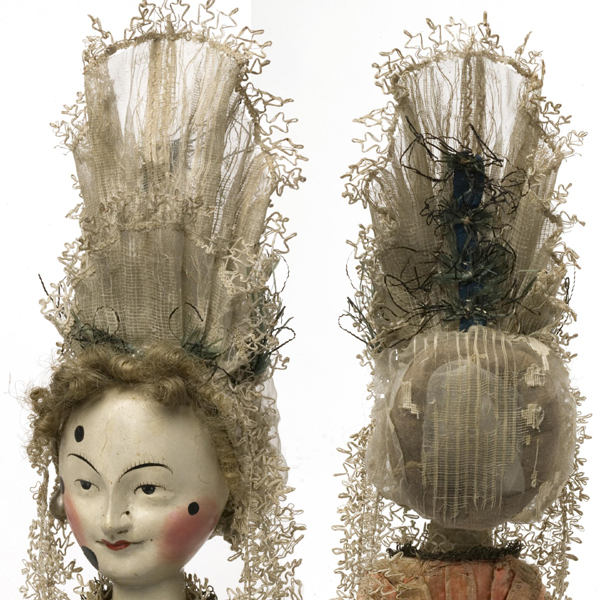 Mechanical dolls made in the 19th century by Theroude can sometimes be found wearing this sort of headwear. An 1820 issue of The Ladies’ Monthly Museum or Polite Repository of Amusement and Instruction, discusses changes in the current style of morning caps. 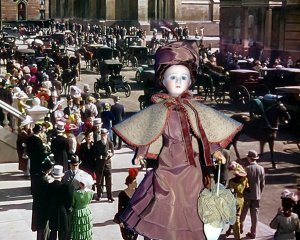 By the 19th century we see dolls mirroring the changing whims of fashion. Headwear is distinctively different, as was costume in general, depending on the time of day and social activity being engaged in. Morning caps were for use during breakfasting or private time at home before one’s hair was suitably coiffed for the day. Hats of various style were worn with walking suits or visiting costumes, lighter headwear of ribbons, flowers, feathers, and jewels were the choice for evening wear. 19th century publications such as the The Ladies’ Monthly Museum and Godey’s Ladies Book advised women of the latest trends in millinery fashion and the proper use of each new style. 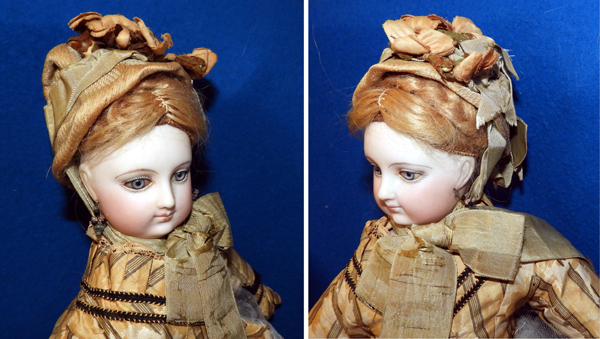 A China doll from the mid-19th century models her own simple day cap. This 5″ “Benigna” doll was made by the ladies of the Bethel Circle of The King’s Daughters Advent Moravian Church in Bethlehem, PA. 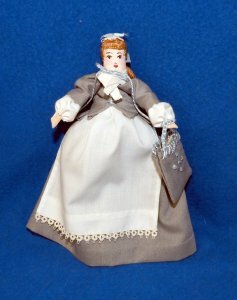 This doll was named after the founder of the first Protestant boarding school for girls in America. Headwear on a doll could also indicate social status. 19th century women of the Moravian church wore caps trimmed in colors which denoted their place in society. Widow’s caps were trimmed with white, married women wore blue trim, pink trim appeared on the caps of single ladies, and cherry was reserved for girls not yet of marriageable age. 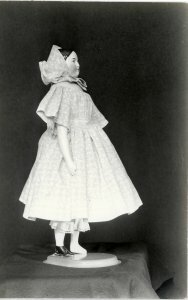 Moving through the 19th century dolls present a record of hat styles for each decade. China and papier-mâché dolls, which were often costumed at home preserve the day to day styles of working- and middle-class society. 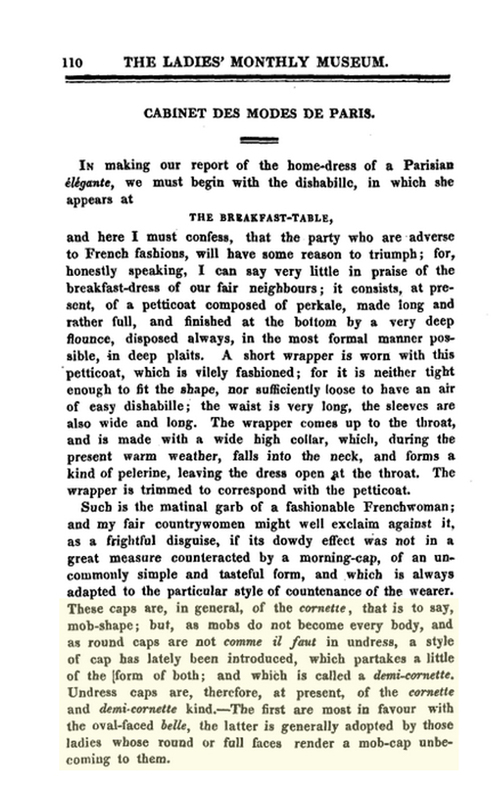 French Poupées and Bébés echoed every nuance of the human world of high fashion. 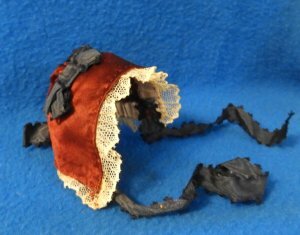 French Poupees model the hat fashions of their time for collectors and costume historians today. This Poupée Peau by Bru wears her original ensemble which includes her hat. Bonnet-head dolls provide today’s collector with accurate records of hat styles of their period. A ca. 1940 photo of an 1840s china doll referred to today as a “covered wagon” shows her in her original home sewn girl’s outfit. She wears a simple cotton bonnet. The advertising illustrations of the various doll making firms not only aid today’s collector in determining original costume but also serve as an excellent resource for collectors that enjoy recreating antique doll costumes. 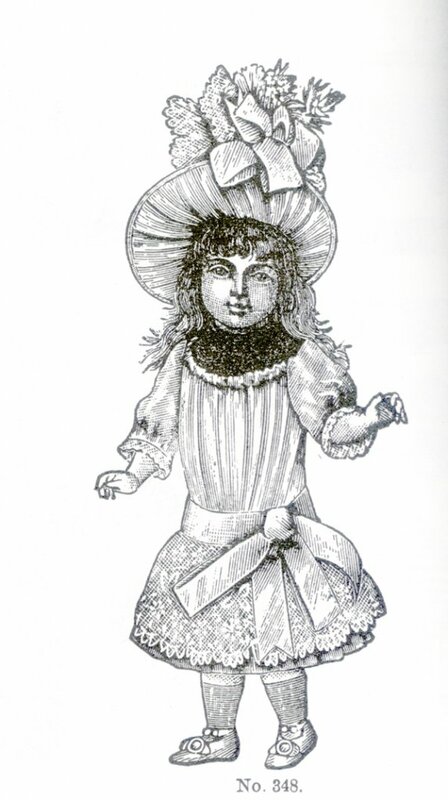 This doll was advertised in the 1890 catalog of Marshall Field & Co.
As previously mentioned, headwear can also indicate national affiliations. Regional costumes from around the world usually include specific headwear styles that identify the wearer. In the era of the world-wide adoption of the Tee-shirt and jeans, details such as the hats of traditional regional costumes are often best preserved on the dolls that wear them. 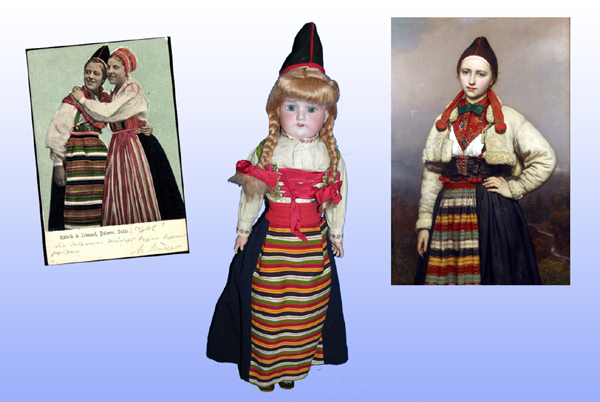 This doll wears a faithful reproduction of the costumes worn by women of Rattvik, Dalarna, Sweden. A ca. 1940s & 50s Jumeau mold 221, Great Ladies of Fashion series enjoys a stroll down 5th avenue in the famous parade celebrating spring. Moving into the 20th century hats continue to be an interesting sub-collection area in doll collecting to be enjoyed, studied and displayed. Perhaps your dolls are ready for a stroll down 5th avenue in their finest chapeaus!